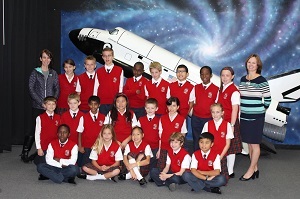 This October, the 4th and 5th grade classes had an exciting field trip to Challenger Learning Center in Wadsworth. After exploring the Solar System in their Star Lab, students participated in a simulated space mission. Students were required to perform hands-on science experiments and team building activities in order to conclude their mission successfully. Everyone had the opportunity to participate on one of eight teams including Communication, Data, Navigation, Medical, Remote, Life Support, Isolation and Probe. They moved through both the Spacecraft and Mission Control as they attempted to launch their probe through the tail of the comet. Teamwork was imperative to make this mission a success! One student commented, “This is the coolest trip ever! I like when I get to work with the robots and controls. I like working with the panels too. This feels like a real space trip!” The entire class said the experience was challenging and fun; a once in a life opportunity! ELA 4th grade teacher Mrs. Beattie was delighted to see her students learn more about careers and opportunities in the STEM fields. The students also got to see the importance of good communication and following directions. It was also a wonderful way to reinforce what they learned about the solar system.